I think of myself as being an open minded person. I can talk to and befriend all sorts of people – young and old, poor and rich, all skin colours. I don’t make snap judgements. I think the best of everyone and I let curiosity lead me to new, unexpected meetings and experiences. I don’t allow fear and prejudices take overhand. And it’s all lies, of course. The only true thing about me is that I’m good at lying, especially to myself. True fact: apart from a friend who refused to do his – at that point – mandatory military service, I don’t know a single person who has spent time in jail. As far as I know I don’t know anyone who has been into dealing and using drugs. I don’t have any friend who has been sacked from a grocery shop after repeatedly turning up late at work. I don’t know any people that you really would consider poor. I don’t know any person with black skin. I live a privileged middle class life where I interact with other middle class people. My friends are wonderful with different life experiences and they enrich my life, don’t think anything else. But I can’t recall that I’ve ever even as much as spoken to anyone resembling to Oscar Grant. 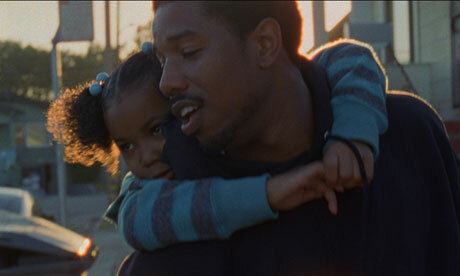 And that’s why watching movies like Fruitvale Station is so essential. Fruitvale Station is based on the true story about how 22 year old Oscar Grant accidentally was shot by a police officer in a station on New Year’s Day 2009. The movie starts with authentic images from the event, captured by the cell phones of witnesses on spot. Then it goes back to the early morning of New Year’s Eve and as we follow Oscar through the day until the point where he died, we get to know him pretty well – his good sides along with his bad sides. He’s neither a devil, nor a saint. This is a feature film, although it almost feels like a documentary at times. The camera follows Oscar discretely as he’s moving between different situations, meeting different people that are important to him in his life. We see Oscar The Father, Oscar The Cheating Partner, Oscar The Drug Dealer, Oscar The Loving Son. Michael B Jordan makes him feel alive, like a real human being and not a stereotype he easily could have become. This could easily have become a digital drama about the innocent black guy who wrongly was shot by policemen. It could have been an accusation act or a movie taking place in interrogation rooms and courts. But they chose to make something different: a nuanced portray of a kind of person that you don’t see a lot of in movies. I’m so glad they made that decision. I haven’t walked in Oscar Grant’s shoes and it’s unlikely that I ever will. Of course I could lose my job and run into difficulties like everyone else, but I will never experience what it is like to be discriminated because of my skin colour. I have never had a friend like Oscar and it’s quite unlikely that I’ll ever get one, if I’m honest with myself. While there isn’t any law against me and a 22 year old former convict getting friends, our society is too segregated in reality for this to happen. But Fruitvale Station allowed me to come a bit closer to him. I was reminded of that behind every news headline you see about someone dying in a crime or violence related incident, there’s also a hidden story about the people involved. There are children who lose their parents, mothers who lose their sons, partners who lose their loved ones. And each one of them is a human being, not as different from me as I may think as I throw a glance at them from the other side of the platform at the subway station. Another great review Jessica. Think this hits here sometime this month, maybe next and I’m looking forward to it. I thought Sweden was last to get it, but apparently not. I definitely recommend you to see it. Thanks! Keep it on the watchlist and give it a go. It’s worth it. Great post, Jessica. Thanks for opening up. Really curious about this film. Thank you Fernando! I hope you get to see it. It was a good movie and the ending, being a father really hit me (when the mother and daughter are in the shower). Also learned to try and not compare the actual events with the movie version because there are always details which were fabricated. Yes, this year we’ve had a LOT of debate and bashing against movies “based on true events” that have changed some stuff to make it work for theatre. I can’t believe how much complaining there has been, especially here in Sweden about some Swedish movies. I’m SO done with that. And yes, I was hit hard by that too. I was also touched by the waiting at the hospital. Yeah, as a parent you really understand the emotions the characters are going through. What a good quote by the director! Thank you for your kind words and for sharing it. As you see by what I wrote, he was absolutely right. Great work once again, Jessica. And, once again, we completely agree. I too gave this 4.5. A hard hitting and emotionally devastating film that really took me aback. This is one of my favourites of the year. Cheers! It’s been a while since I watched this, but it’s very clear in my memory. It really made an impact. I remember crying quite a bit watching it. Sadly I don’t expect to see it in a lot of top lists. And my own is crowded, it’s that kind of a year. We’ll see where I can squeeze it in.